21 days doesn’t seem like a long time. And on the face of the competition, working with five completely random people was a bit unsettling at first. But the three weeks turned out to be one heck of a ride! I spent more time with the 5 people in 21 days than I did with my friends. I spent more money on coffee than I did on takeaways. I put more work into this business proposal than any other class work this term. And would I take any of it back? No sir. Our journey finished on Monday. All six teams presented in front of six judges in a 15 minute pitch to get their ideas across. Three were selected to present tonight – we, unfortunately, were not one of them. Although we thought we nailed both our business proposal and our pitch, we didn’t quite cut the mustard. Rocking up on Monday to hear the other teams, I wasn’t sure what to expect, but there was an insanely high standard! When you think about it: five academics, competitive environment, different skills – it’s a recipe for a creative cauldron of concepts and ideas. And there were incredibly diverse solutions, which surprised me given the $5,000 budget. But as the competition comes to a close tonight, it has been a good time to reflect on the challenge. Before this month I had never put together a business proposal – and I sure didn’t think I would be doing one for a Filipino village anytime soon. But it’s a challenge I put to everyone.. if this competition comes up again, dive head. Go head first and embrace another culture. It’s a crazy but rewarding three weeks! The first match of the Fifi U-20 World Cup right here in Christchurch! There will also be games this week on Thursday, and Sunday. See the next big football stars in action! First Thursdays: Paper, Scissors, Rock ‘n’ Roll: 5-9 in Sydenham. This event only takes place three times a year- so don’t miss out! The evening which include: art, music, night markets, gallery events, performances and exhibitions! There will be free buses to transport people around the 4 main areas, but everything is also within walking distance. 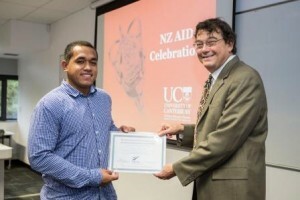 Second year Civil Engineering student Charlie Sofe from Samoa received the 2014 award of excellence at the UC NZ Aid celebration event earlier this month. 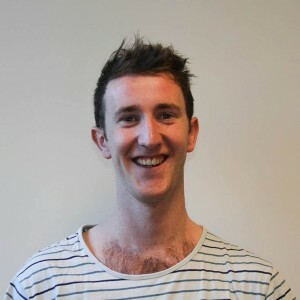 Check out all the photos on the UC student’s NZ Aid site. NZ Aid is a scholarship scheme offered to candidates from nominated developing countries around the world. UC currently has around 100 students funded under this scheme studying a wide range of subjects and degrees with particular focus on the developmental needs of their home country. Half of UC’s NZ Aid Scholars fall into the New Zealand Pacific Scholarships (NZPS) category. Each year, the Ministry of Foreign Affairs and Trade gives an award to UC’s highest NZPS academic performer over the previous academic year. Charlie is the recipient of this award for 2014. Charlie hopes to become a Civil Engineering consultant, contributing to the continuing development of Samoa’s infrastructure. Congrats Charlie! And in honour of Samoan Language Week, fa’amalo!